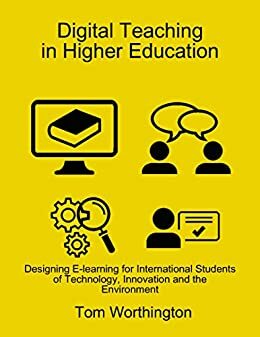 My book Digital Teaching In Higher Education , is now available as a Kindle eBook from Amazon. But setting this up was not easy. Having successfully published paperback, hardback, PDF and ePub eBook versions of my ICT Sustainability and Digital Teaching books, with Lulu.com I thought I was all done. Then I discovered a note from Lulu to say that Australian based books are not published for the Amazon Kindle. So went into Kindle Direct Publishing (KDP) and started the process. The KDP process is similar to Lulu. You enter the details of the book (title, author ...). Then upload the content, design a cover, select a price and how you would like the book distributed. Creating the eBook with KDP required some changes to the word-processing document I had used for Lulu. I have the content of each section of the book stored in a separate file as HTML code (the same files are used, unchanged for the web site). These HTML code files are imported into a LibreOffice master document (.ODM). There is one master document with a table of contents which is exported as a PDF file for the hardback, paperback and PDF eBook editions. There is a second master document with the same chapters, but without a table of contents, for the ePub edition (as ePub has a separate contents file). Lulu does not accept .ODM master documents, so I export it to a normal word-processing document (.ODT) and Lulu converts this to ePub, adding the table of contents. KDP does not accept LibreOffice files and when I tried one exported to .DOC, it did not generate a table of contents,page breaks for chapters, or insert images. Exporting to the newer .DOC format produced a better result with the page breaks included, and images, but still no table of contents. The ePub file generated by Lulu also formatted well using KDP, with page breaks and images, but also had no table of contents. So I modified the .ODM master document to add a table of contents (ToC) and then saved as .DOCX). This ToC less detailed than the table of contents for the printed book. The printed ToC is nine pages long, which would be tedious to scroll through on screen. So the eBook version omits sub-chapters, reducing the ToC to one page. Also I omitted page numbers from the ToC, as Kindle eBooks don't have page numbers. Next time I revise the ePub ebook, I will have to decide if I include this abbreviated ToC. The ePub ebooks do not normally have the ToC within the text of the document, it is supplied via a separate XML file (in this case that file is generated by Lulu). But I would prefer to have just one master document to generate both the ePub and Kindle eBooks. Also it might be worth using a similar abbreviated table of contents in the print edition (with page numbers) before the full ToC (it can be daunting for the casual reader to see nine pages of contents). One quirk of the table of contents function in LibreOffice is that I found I had to "update" it each time I opened the ODM document. If I did not do this the links did not work. KDP Select is an option where your book is made available for rent to subscribers, however this only available if you do not publish the ebook elsewhere. As my ebook is already available trough Lulu, I did not select this option. KDP Pricing Support offers to help suggest pricing by analyzing the manuscript and comparing it to sales of similar books. However, I could not get this to respond (it is still in Beta.Kindle books are proved with either s 30% or 70% royalty. The details of are complex, but the 70% royalty seems to be for lower priced books (up to US$9.99), mine is US$6.90, so I chose that option. After I published my Kindle edition, KDP offered the option of a print edition. As I already have this through Lulu, I did not try the option. Like Lulu, Amazon.com offer an author page, where I uploaded a photo and bio. Lulu automatically links the books you published, whereas Amazon alsos you to search for others, where you are the author, but not the publisher. Amazon will also display recent posts from your blogs on the page. One troubling aspect is that some third parties are selling some of my books on Amazon for many times the retail price. These are books I have not yet listed on Amazon directly. Hopefully when I have them up myself, this will stop.